Can White capture the cutting stone? Charles White has a choice of possible nets after and . + looks to be best for shape, but one has to take into consideration the blunt . , as here, is a failure since escapes. here certainly works in reply to . White would prefer this one to the right. But White can't afford this: puts White in trouble. see Minue's solution below . If White continues with a, she wins. Here White's net fails after . This way might actually be possible, though, for White, as a fighting solution. 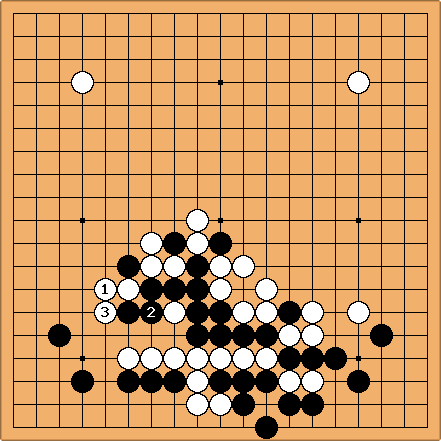 Black's stones emerge, but in poor shape. jwaytogo: I disagree with . 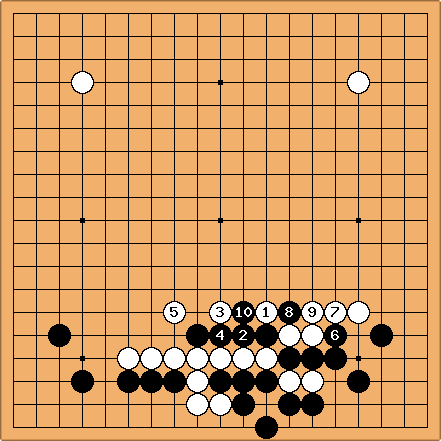 Why not just play directly at or , then the 4 black stones are dead. White is thick. The cut off white stone is still worth some aji. White really wants to be light here, so is always worth considering. Up to may be forced. 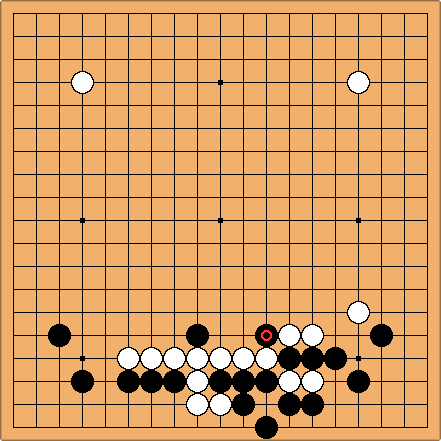 White is doing very well in the centre. w.r.t. ,  see Minue's solution below . If White continues with a, she wins. If White can survive this fight, this way of playing is attractive. For me it was a development too, I think dia (9) is a good technical, local solution - if the aim is to capture the cutting stones. I did not find it in first instance. The real solution could be something else as making Sanrensei or another see-and-wait strategy. tderz: what can black do with the 3 liberties a-b-c ? tderz: Whether this is a threat to white , depends on the whole board position. is a mistake, see dia (6) below. should be at . all of the points p-q-r-s-t belong further possiblities. it should be somewhere around u in order to avoid the sequence of dia (6) and protect the cutting point v.
only black b would lead to auto-atari. tderz: this is understandable but not safe against a black escape either. tderz: there is no ladder with at hence, black succeeds in cutting of. White has got a wall with a filling - this is a great result, nothing to be ashamed of. White has now invasion tesujis t or u at her disposal if she wishes too. And the game has just started! If white could also protect against the separation it would mean that black had collapsed. tderz: would it make a difference if there were some white stones ? Could one induce them by a wedge before starting - a different - net? tderz: now the cut at a cannot lead anymore to multiple ataris and a final escape. In order to prevent black's escape r-s-t-u, White has to prepare directly after ( and in dia (10)) with the blunt looking exchange p-q (or could one try something stylish-looking as v, with the danger of discovering that things develop different). If white hopes for the p-q exchange after the exchange -black r , it's too late. 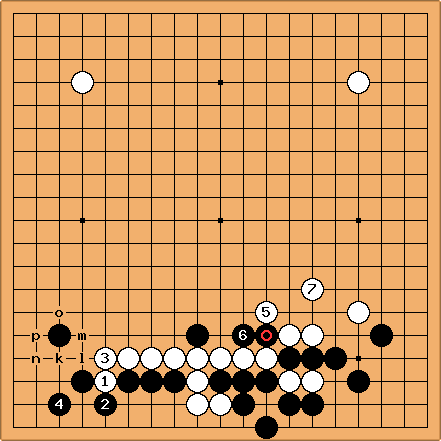 Then Black would connect to with s and capture the white group. tderz: this looks even better - it seems to capture in sente by threatening d.
Attempts for escape a can be blocked by b. Stylish b is simply countered by white a. Sometimes the inside hane f after black d, white e leads to results, but white here simply takes the penultimate liberty. tderz: different strategy - the wall is strong enough to survive even without (directly) catching the cutting stones. In respect of the invasion points t and u in digram (7), and are however aji-keshi and not needed, because they don't contribute to catching the cutting stone. Minue I didnt check if there are other ways to capture black. 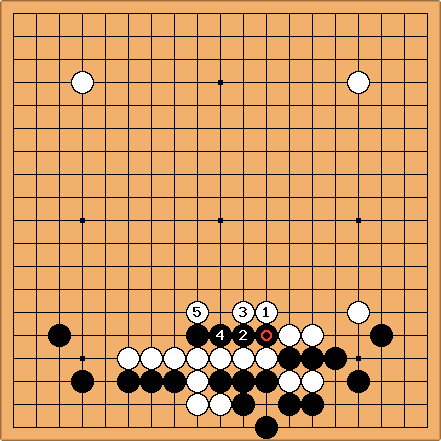 But for me, the following variation looks simple and clear way for white. Sequence is rather long, but its course is quite straight forward, and does not have any other branches, so not hard to read and follow it with some caution. tderz: this solution is enriched with overwhelming thickness, much better than .